Mobile games publisher Gameloft might have thrown in the towel on Android, but that is a mistake. I certainly understand why they gave up on Android. Since launching in February of this year, our own Whitepages Caller ID app has become a top ten grossing Android application, and yet we’ve seen less than $54,000 in revenue. While our iPhone app download counts are in the millions, our Android app downloads are a mere 17 percent of this volume. In addition to being an open platform that facilitates device innovation, Android offers choice and progress when it comes to the marketplace where consumers discover and download applications. While iTunes and The Official App Store are the only places consumers can download apps for their iPhone, Android’s open platform allows merchants like MobiHand and HanDango to set up storefronts, ultimately providing more purchasing options for consumers. Google’s focus on improving its the user experience in its own Android market will also continue to boost revenues for app developers. For example, when the recent 1.6 OS (Cupcake) upgrade provided a much needed facelift for the market, we saw an immediate 18 percent lift in sales for our paid Caller ID application. While Google still has a long way to go in terms of reaching as many consumers as iTunes does, with the power of “what’s hot” and capabilities like in-app purchases, they have begun to enlist an armada of players—including carriers with deep experience in integrated billing—to create better markets for the merchandising and sale of applications. In early November, T-Mobile announced that they will launch their own Android market with integrated carrier billing, giving consumers the ability to charge applications to their phone bill. Also on the Google market roadmap is the ability for publishers to offer subscription purchases. The low friction of bill-to-phone capabilities for consumers and the recurring revenue benefits of subscription services have the potential to drive significant revenue into the hands of developers. For example, we recently launched a service that allows consumers to text any number to 566587 (LOOKUP) to identify unknown callers and the bill-to-phone conversion rates have been two times what we have seen with the application market conversion rates. Thirty-four percent of our customers selected the unlimited subscription option over a single-use fee. With the influx of more applications that require persistence—streaming music, Facebook, Skype, IM, & Caller ID—Android’s ability to run more than one application at a time is becoming more important. The “always with you, always on” benefits of mobile will be a key advertising opportunity especially for location-based offerings. Publishers will be able to use Android to generate more revenue by staying in front of users to produce more ad impressions. Advertisers also will be able to reach consumers closer to the point of sale, and take advantage of geo-triggered offers. Higher frequency of usage should also reduce churn for subscription-based services. T-Mobile launched the first Android phone in the U.S., and embraced the open platform. Any other U.S. carrier might have been tempted to meddle, but T-Mobile proved that an open platform would not be riddled with malware and abuse. With Verizon now going big on Android, we will start to see significant uptake. Verizon has 89 million customers with an average Data Revenue Per User of $15.69 to T-Mobile’s 33.5 million customers and $10 in Data Revenue Per User. Sprint has the highest data revenue per user of $19 and 48.3 million customers. 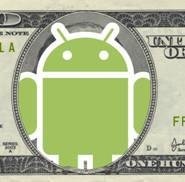 In short, Verizon and Sprint will attract many more customers willing to spend more money on Android applications. For the same reason developers support multiple game platforms, browsers, and operating systems, Android just needs to achieve enough consumer scale to justify the investment. As long as Google stays focused on providing freedom in an open and competitive ecosystem, app developers will be rewarded. In just six months, we handily recouped our investment from launching an Android application and expect a significant return next year as Google leverages the reach and power of players like Verizon, T-Mobile, Sprint, Motorola, HTC, Dell, and Samsung to grow its platform. Future app developers should approach Android with more than a simple port of an existing iPhone application. Our initial interest in Android was motivated by innovation and new product features that required integration with core device functionality offered by Android but firewalled on the iPhone. Android’s absence of an approval process facilitates rapid product development and the open platform provides the opportunity to innovate, giving every developer the freedom to compete and earn a place in the consumer’s pocket.